Now I’m sure many of you looked at that picture and thought, “I can’t tell what’s going on there!” Yep. Exactly. And let me assure you that standing in the room and looking at it in person wouldn’t have helped much. It was a big jumbled mess of seemingly random boards everywhere. 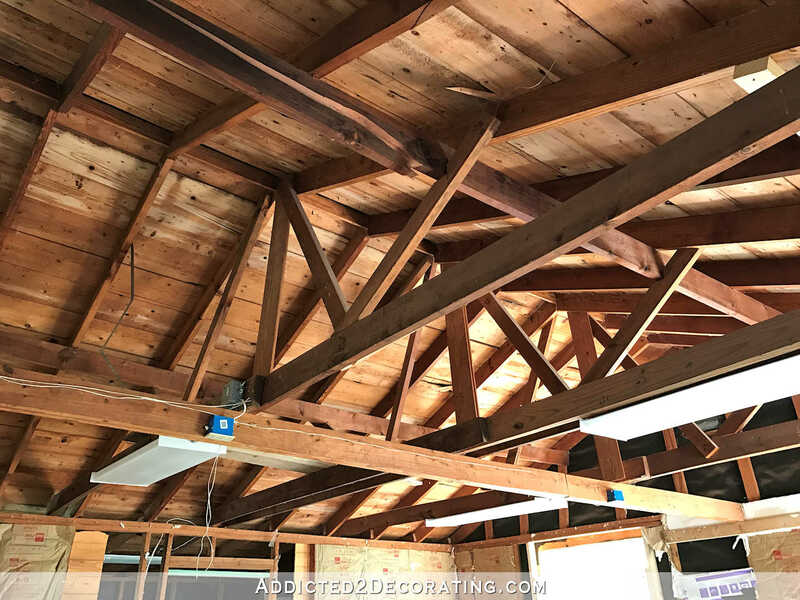 And the main beam that spanned the width of the room (the one with the blue junction boxes attached to it) was actually below the 8-foot ceiling line…. So if I had kept the roof structure just like it was, the ceiling in the studio would be only 7.5 feet high. A ceiling that low in a huge 19.5′ x 22′ room would have looked a bit cave-like. In addition to the jumbled mess on the inside, several of you noticed that the ridge line had a very noticeable sag to it. I was told by several different people (inspector, roofers, contractors, etc) that while it looked bad, it wasn’t structurally unsound. They said that sag was probably three decades (if not more) in the making and was due to the fact that whoever built the garage used a 1″ x 4″ board as the ridge board. But it did look horrible, and I wanted it fixed. I talked extensively about it with the project manager and framers, and they assured me that they’d do everything they could to straighten it as much as possible, but it might not be perfect since again, that sag was several decades in the making and trying to straighten it to perfection in an hour could potentially cause actual damage to the roof. Now instead of an insufficient and sagging 1″ x 4″ piece of lumber supporting the ridge inside, I now have a massive 3.5″ x 16″ (or was it 18″?) LVL beam supporting the ridge with new tie beams just under the LVL beam. And what did that do the outside? Well, it’s not perfect, but they were able to straighten it out much more than I had expected, so I was ecstatic. In other news, I’ve made a flooring decision. After reading all of your comments about tile, most of which were warning me about how hard tile is on the feet and legs, I’ve decided to just carry the red oak hardwood flooring throughout the studio, and then use tile only in the half bath and the mudroom at the back. 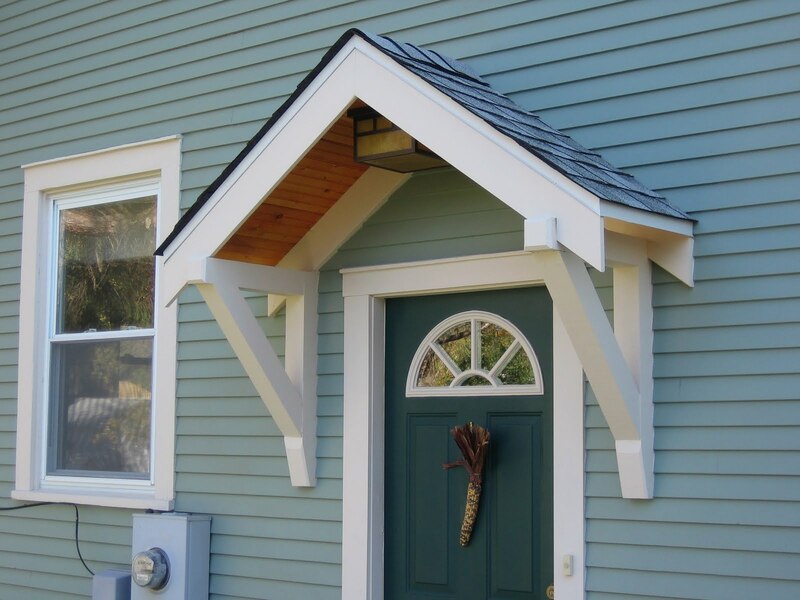 And on the portico vs. awning topic, y’all have convinced me that the portico makes much more sense. I really wanted to go with the awnings option, and I had hoped that more of you would have positive experiences with awnings to share with me. Sadly, that wasn’t the case. And while I’m admittedly and unashamedly a form over function kind of person, there are times when practicality has to reign. All of the talk of having to remove awnings during bad weather, clean them often, replace them when they fade and tear, etc., scared me off. I found those at Architectural Depot, and they come in many different sizes and species of wood. And they have probably the biggest selection of wood corbels and brackets that I’ve found. So things are moving right along! These guys will be done with their part of this project pretty soon, and then it’ll be handed over to me to finish out. The progress will definitely slow down at that point since I’ll be doing a lot of the finishing myself, so it’ll be interesting to see how that goes. It should be fun! My oh my, what an improvement to the structure! It looks like they’ve done a great job in a short amount of time. This is a huge step forward. How exciting! I love that the new beam has straightened the roofline. Also love that your ceiling height will be perfect for your studio. Huge progress in a short amount of time. That awning you want is just adorable. GGGGIIIIRRRRRRRRLLLLLLLLL You done chose well! LOL…must you expose all of your weirdness on my blog? 😀 Just kiddin’. You go ahead and let all of your weirdness and insanity shine. 😉 But, my dear, I chose the portico, not the awning. portico just means wooden awning in Italian. Kristi and I are just laughing about that because I was just joking around. I had no clue it stemmed from Italian. 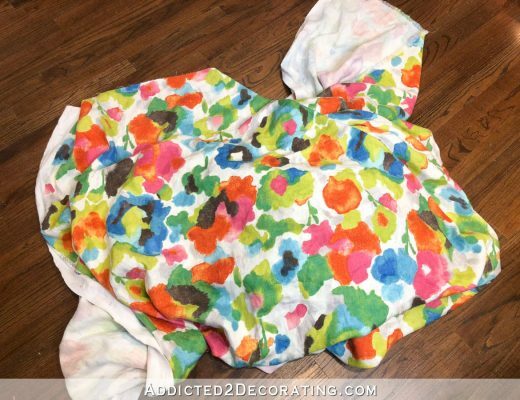 I’m all for seeing more of the “hubs” on this blog…I laughed out loud at his post. That looks great!! As far as flooring. I would give some thought to sound dampening. I don’t recall seeing any mention of soft material use that would provide sound absorption for the studio. Not that you use large noisy equipment– oh wait you do😉 Just a thought. Awesome job straightening the roof! Yay for the portico! Wow, what a difference! And I love those portico brackets!!! Perfect. The room is looking fantastic and it’s so good you hired this work out, as it is nothing one person (even a very determined one with the occasional help of her brother) could really have done by herself. LOL you and Matt are adorable!!! And your studio space is going to be incredible! What a journey you are taking us on! Wish I could find someone that good just to install a plank ceiling. That portico picture gave me inspiration for my front door! I have the same generic door, but I like the contrasting trim on the sunburst! Ok you and “The Hubs” are just toooo cute! I have to tell you I get so excited when I see that there is a blog post to read! So happy for you! It looks so great! So glad you picked the portico! It makes so much sense for you, and everyone’s comments were very valid. Another good reason to not do awnings is the light they take away from interior rooms. And being your breakfast room windows are “the” natural light for your kitchen, you wouldn’t want that!😕 If you wanted some architectural interests wooden trellis awnings could be an option at some point. That would look neat over the breakfast room windows! All is coming along fantastic but, how’s your back? You are about to inherit a HUGE project! I forgot to ask that! Hope you are a-okay! They did a great job on the roof line! You found some good workers. Hope you give them rave reviews for future business. Glad to hear of your choices – I think you will be happy with them. As for the sound deadening, that’s a valid point. But you could handle that with the type of drywall/insulation you choose. There is an issue with sound bouncing around in a larger space such as this. We have an open floor plan, and I have added drapery and large area rugs to help absorb some sound. We also have 9 ft. ceilings, so that factors in to it as well. Know where an awning might be nice to use? 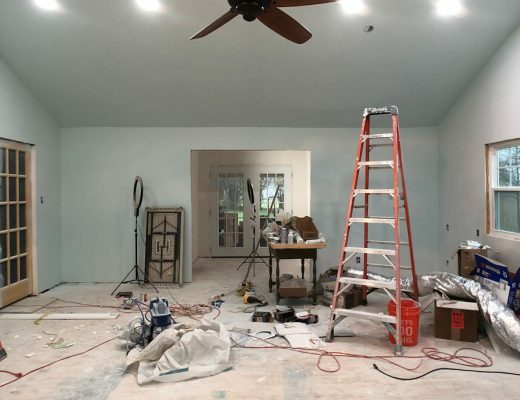 Over a back deck or patio once you build-out the family room. It’d be just the right place for some extra shade and a little festive whimsy. I’m so glad you went with the portico! I didn’t weigh in on that subject but from personal experience, fabric awnings offer a definite love/hate relationship! Unless you love the maintenance they require and routine replacement. The portico is so much more ummm, permanent looking to me for the area where you are putting it, structural, part of the house. Rather than the feel of awnings that are more like curtains dressing a window to me. Looking great girl! Kristi, It looks fabulous! You are going to enjoy working in this space so much!! For a time when my children were young I worked out of my house and I could only dream of having something like this…………I wanted a place I could leave what I was doing and shut the door lol…I wish you so much luck with this project!! Thank-you for sharing your adventure. I enjoy watching your progress. It is unreal the turn around time that you accomplish things. I think that the wooden floors will be beautiful and the portico and added bonus to the exterior. I was wondering if you had thought about putting a pocket door into your work room from the dining room? They take up less wall space and are so convenient. Enjoy the journey. It is so fun to watch. Is Matt an engeneer? He has such a good sense of humor! Love it! Matt’s a computer geek. 😀 Computer networking and such, although he doesn’t work in that field now. Really excited for you! Are you going to build the portico, or have someone else do it ? Or do you just need help with installation? I really want to try to build it myself. We’ll see how it goes. Just now I was on Pinterest looking at different porticoes trying to see exactly how they’re built. I think I can do it! But yes, I might need help actually installing it. I imagine it will be very heavy, but certainly very bulky and unwieldy. Love all you’ve got going on! And I think you’ll like the portico best, too. One request from a wanna be DIYer, needing to put in one old window. I’m reusing a small window, in place of two large windows, and it has been so long since I removed that window that I can’t find the pieces that were under the sill. 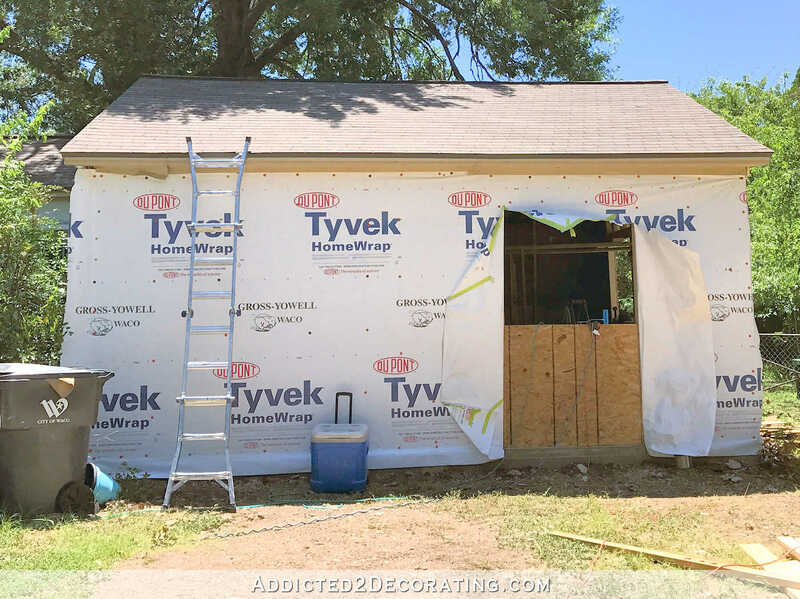 So could you possibly video or at least document at least one of your windows being installed, or point me to a video that goes from scratch on building the sill and setting an old wooden window! I can’t seem to find a cross section drawing of what it should look like, to get the angle of the sill. Thanks in advance for all your help! I’m not sure that my window installation would be much help to you. It sounds like we are using totally different types of windows. My windows come with a nailing flange that just pushes right against the outside of the house and has pre-drilled holes where you nail the flange to the OSB on the outside. I do have a post where I show how I trimmed out my living room windows, though. I can find it if you think that might help you, but my window stools (sills) don’t have an angle to them at all. Kristi, do you have to put in 8′ ceilings? 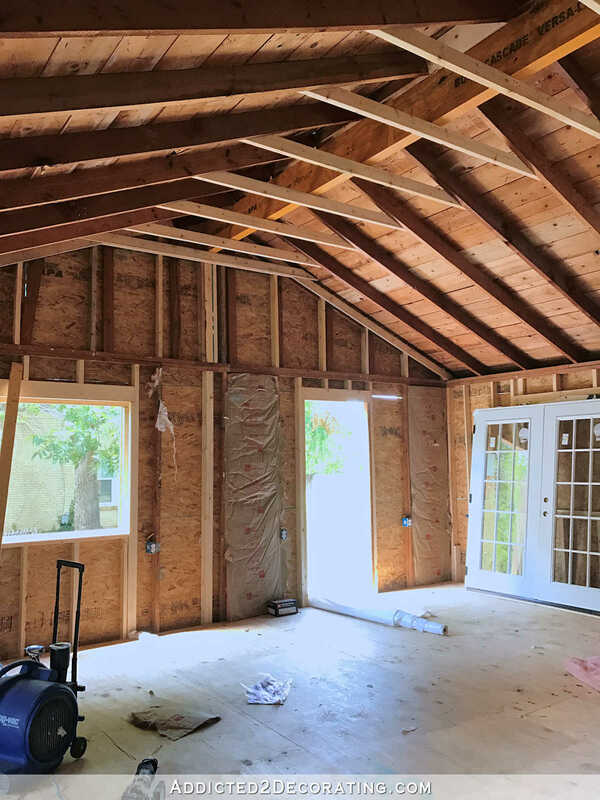 Could you keep the contours of the garage and have a high sloping ceiling? 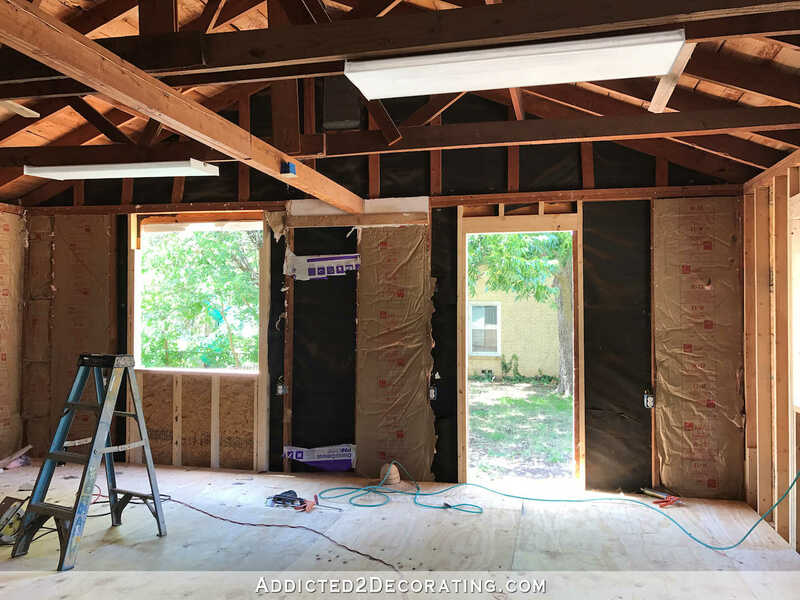 I just love how the contractors fixed your garage roof, it looks so much better inside and out! Another thought – yes, ceramic tile floors look nice but they absolutely are COLD. I like your idea of carrying the oak flooring into the renovated garage, for continuity. I think the roof looks great and the inside, too! 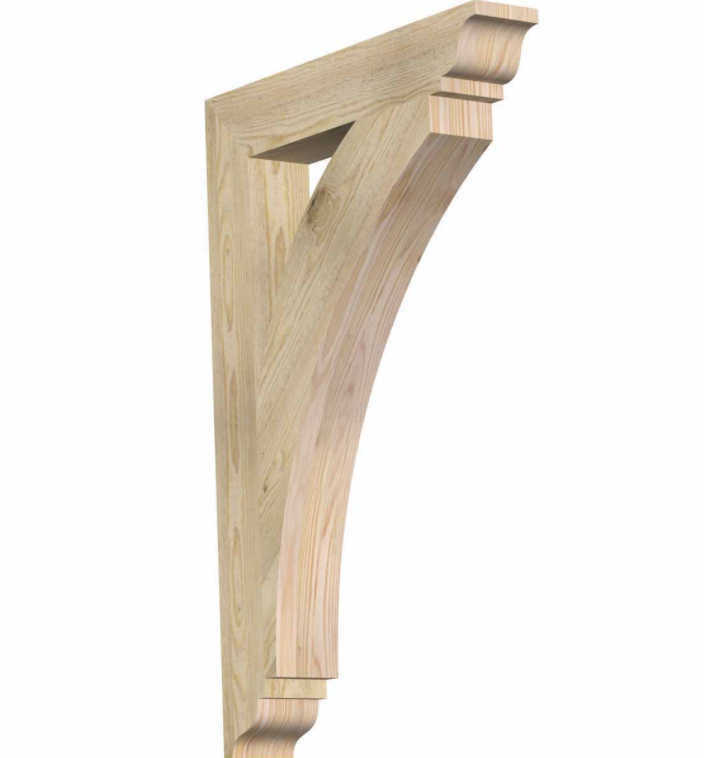 Those portico supports are charming. It’s going to look so fab! 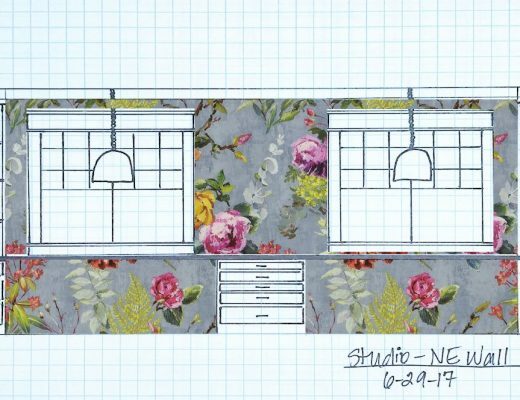 Tile is great in rooms where you’re not doing a lot of standing or walking but for a workroom? Give me wood every time! So much kinder to the knees and back. Love the portico! I love the look of awnings but must admit, with brutal honesty, I’d be very, very lazy about they’re upkeep, lol! I can’t wait to see how you build the portico or have the workers do it. I want one over my garage door. If you remember, include all the measurements. I may be copying it!! Great job on everything thus far. I love it all! BTW… You are my DIY hero! 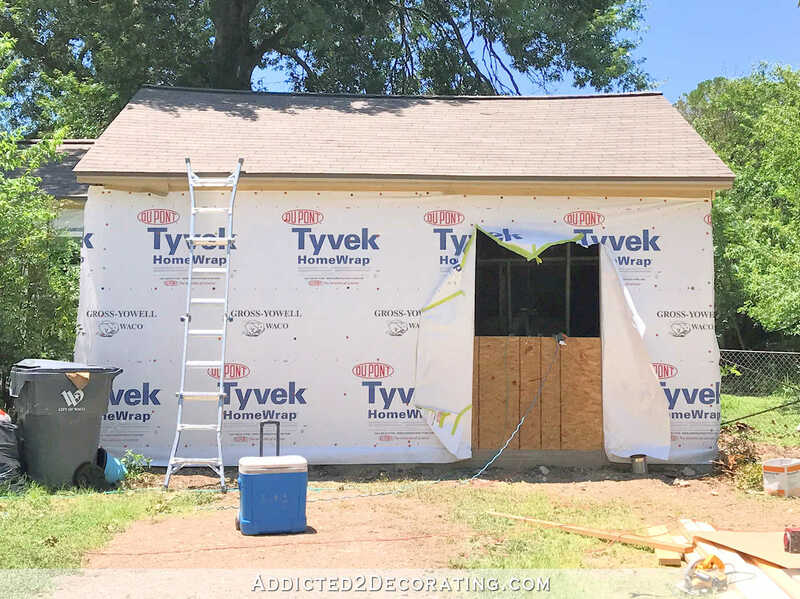 I thought of you this weekend… I drove past a house that had a striped fabric awning over their front door, and it was a MESS! Covered with pollen, droopy… I think you’ve probably made the right choice with the portico.